After a successful economic mission in February, that included the United States team of MAECI, General Electric and Eaton Corporation, a memorandum of understanding & Protocal was secured between the Government of Cameroon and MAECI. This was signed in April by HE. Dr. Basile ATANGANA KOUNA Minister of Water Resources & Energy of the Republic of Cameroon. The MOU designates (5) regions in need of Solar energy in the range of 400Mw to 500Mw, over the next 5 years. MAECI has been granted exclusivity in these regions for the installation of a solar energy solution. MAECI will undertake a turnkey feasibility study for the electrification of these different Regions of Cameroon, using solar photovoltaic (PV) systems. This request is in support of the “National Energy Development Plan” set up by the Cameroonian Government, and aimed at fostering the well-being of its population and future generations. 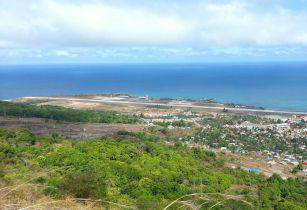 A microgrid case study: The Annobon Island Microgrid, a reliable and cost-effective island microgrid. Annobon Province, an island off Equatorial Guinea in west central Africa, has a population of approximately 5,000 residents. The residents only have reliable electricity for up to five hours per day and spend an average of 15-20 percent of their income on supplemental power. They needed a solution that would eliminate the expense and provide them electricity for 24 hours a day, seven days a week in order to become a better functioning island. As part of The Equatorial Guinea’s National Economic Development Plan Horizon 2020, which aimed to make Equatorial Guinea an “emerging economy” and accelerate its development and democratization by 2020, the group sought outside help with their power dilemma. The government of Equatorial Guinea chose MAECI Solar, a division of Management and Economic Consulting, in collaboration withPrinceton Power Systems to install 5-MW solar microgrid system on Annobon Province. The island microgrid provides reliable, predictable power and supplies enough electricity to handle 100 percent of the island’s current energy demand and allow for the largest self-sufficient solar project on the continent of Africa. The solar microgrid features 5-MW solar modules, system integration, an energy management system, controls, and energy storage. Offers advanced smart-grid functions saving customers time and money. Features built-in smart functions, such as peak demand shaving, photovoltaic (PV) ramp rate control and area frequency regulation (AFR). Highly innovative design can be configured for various applications and is compatible with advanced grid communication protocols. Converter platform offers high efficiency, proven reliability and unprecedented flexibility. Princeton Power Systems’ previous global experience in microgrids from Alcatraz Island, the U.S. Department of Defense and private sector customers was relied upon to improve the quality of life for people on Annobon Island where grid power does not exist or is not reliable. This groundbreaking project in Africa will serve as a platform for the one billion people across the world without any power. An OSUCCC – James physician-researcher contributes to his father’s program to improve education and health care in an African village, an effort that is a model of educational improvement, economic development and sustainability. Like many African countries, the West African nation of Cameroon struggles to provide health care in general and cancer care in particular. The nation’s 22.2 million people had a life expectancy for both sexes combined of 56 years in 2012, according to the World Health Organization. The leading causes of death were HIV/AIDS, lower-respiratory tract infections, diarrheal diseases, malaria, stroke and ischemic heart disease. Leading causes of cancer death were breast, cervical, prostate, non-Hodgkin lymphoma, ovarian and liver. In terms of the healthcare providers, Cameroon has eight physicians per 100,000 people (versus 245 in the United States), and 44 nurses and midwives per 100,000 people. In terms of technology, the nation has 0.6 CT scanners and 0.1 radiation therapy units per million Cameroonians, and 17.4 mammography units per 1 million women. The nation has virtually no cancer screening and prevention programs and few treatment options for those who develop cancer. Patrick Nana-Sinkam, MD, a lung-cancer specialist at The Ohio State University Comprehensive Cancer Center – Arthur G. James Cancer Hospital and Richard J. Solove Research Institute. (OSUCCC – James) has roots in the Cameroonian village of Bangou, and he is working with his father to improve the healthcare situation. His father, Professor Samuel Nana-Sinkam, began a foundation in 2010 dedicated to providing educational opportunity for Bangou’s children, improve health care and provide jobs while sustaining the foundation. The approach he is using could provide a model for sustainable improvements in health care and education in other under-resourced areas as well. Prof. Nana-Sinkam was born in Bangou, which is located in Cameroon’s western highlands about 170 miles northwest of the capital Yaoundé. His family has lived there for generations. The village’s 10,000 to 15,000 inhabitants are mainly subsistence farmers who live in homes of mud brick and thatch roofs and survive on less than $2 per day. Pictured Above: PATRICK NANA-SINKAM, MD, associate professor of Medicine and member of the OSUCCC – James Translational Therapeutics Program at The Ohio State University Comprehensive Cancer Center – Arthur G. James Cancer Hospital and Richard J. Solove Research Institute. The ambulatory health center is underwritten by the Charles Sinkam Foundation, the foundation that was started by Prof. Nana-Sinkam. The foundation is directed by Dr. Djomo Armel, a well-respected local cardiologist. Prof. Nana-Sinkam’s story is one of a promising young man, helped by his extended family, who leaves his village, accomplishes much and returns to help others. Prof. Nana-Sinkam’s father, Charles Sinkam, stressed the importance of education. Samuel showed promise in primary school, and family—aunts, uncles, cousins, along with his parents—rallied their resources to help him attend secondary school at College of St. John the Baptist in Bangou, then complete pre-university studies in Yaoundé. He attended college in France, earning a PhD in Economics, Development Theory and Practice, from the University of Poitiers, along with a master’s degree in Statistics and Econometrics from the National Institute of Statistics and Economic Studies (INSEE) in Paris. For a time, he served as Minister of Economics and Finance in Cameroon, then worked with the United Nations Food and Agricultural Organization (FAO). Next, he worked for the International Monetary Fund (IMF). The family lived outside of Washington, DC. There, he attended George Washington University, earning a second PhD in Economics, Monetary and Finance. “As a child, I remember waking at 3 a.m. and seeing him studying at the dining room table,” NanaSinkam says. “By 6 a.m., he’d be dressed and go to work. On Saturday and Sunday, he slept.” At the IMF, he was promoted to executive director, representing more than 27 African countries. He was also a professor at the University of Dauphine in Paris, and a senior risk analyst and adviser with Chase Manhattan Bank New York. His career included being appointed by United Nations Secretary General Koffi-Annan as special representative in GuineaBissau in a peace-keeping mission during that country’s civil war. And he served as director of the Joint FAO/ECA Department in the United Nations Economic Commission for Africa; as a member of the executive committee of the Club of Rome; and as FAO country director in Democratic Republic of Congo and other African countries. This work often took him into conflict areas where he worked to ensure fair democratic elections. Yet, he returned to Bangou yearly when possible, and he helped family members with education and health needs. He founded the Charles Sinkam Foundation to do more, focusing first on providing educational opportunity to village children. “Many leave school very early because families just can’t afford it,” Prof. Nana-Sinkam says. “I wanted to help students in a meaningful way. We provide scholarships to top students to try to keep them in school, and we even provide some with college scholarships.” People come from all parts of Cameroon for Medical Days. The foundation’s attention then turned to improving health care. Pictured Above: Patient intake and preparing of prescriptions at the Medical Day. It began in July 2011 when the foundation held its first Medical Days. During the two-day event, the foundation opens its doors to the sick and injured, to all who need medical care. Since 2011 it’s been held twice a year, in July and December. Care and prescriptions are provided at no charge. People come from all parts of Cameroon, some as far as 250 miles away. Nana-Sinkam notes that physicians who participate come from all over Cameroon and range from general practitioners to specialists such as a cardiologist, pediatrician, rheumatologist, hematologist and ophthalmologist. “We first triage patients—we check vitals and test glucose and other basic parameters, then direct the person to the appropriate subspecialist,” Patrick Nana-Sinkam says. Basic surgeries such as hernia repair are performed, and the local dental school sends its mobile dental unit, staffed by dentists and dental students for onsite care. The foundation has hosted eight Medical Days in all, and some 19,000 people have sought care. Common illnesses treated have included hypertension, degenerative joint disease and pediatric diarrheal illness. Treatments included 250 surgeries and 400 dental extractions. In December 2015, prostate and cervical screenings were offered for the first time. In July 2016, breast self-exam will be taught. Nana-Sinkam has been impressed with the local internists who assist during Medical Days. “In the absence of the tests and diagnostic equipment we take for granted in high-resource counties, they rely heavily on clinical acumen, on sound and touch and on a familiarity with local illnesses. And they are very good at it.” In addition, three or four children have been referred for open heart surgery, which is available at just one hospital in central Cameroon, Nana-Sinkam says. The foundation paid the children’s transportation to the hospital and for the surgery. “The children have done wonderfully. They’re in school and enjoying friends,” Nana-Sinkam says. “It has been an incredible experience—the level of excitement and commitment offers tremendous hope for the community, and they start looking forward to it weeks and months in advance,” NanaSinkam says. The people of Annobon were offered comprehensive hands on and online trainings in how to design, install and maintain solar photovoltaic systems and other renewable energy technologies. The goal of the program was to train technicians, engineers, project managers, and individuals from both public and private sectors interested in acquiring useful and practical knowledge in renewable energies. The program also aims to facilitate the expansion of sustainable sources of energy and to create greater access to electricity for underserved communities in different areas around the world. One program offered included an overview of the three basic PV system applications, primarily focusing on grid; direct systems. The goal of the course is to create a fundamental understanding of the core concept necessary to work with all PV systems, including: system components, site analysis, PV module criteria, mounting solutions, safety, and commissioning. The course also covered the basics of sizing a residential grid; direct system, wire sizing, over current protection, and grounding. This 5 day workshop included hands on labs to understand solar site analysis by using a solar pathfinder, shading analysis, module orientation, solar radiation measurements, among other exercises. To support the formation of highly qualified PV technical personnel, the companies involved are very interested in continuing to provide PV Solar training in Equatorial Guinea due to the great solar development potential in the country. 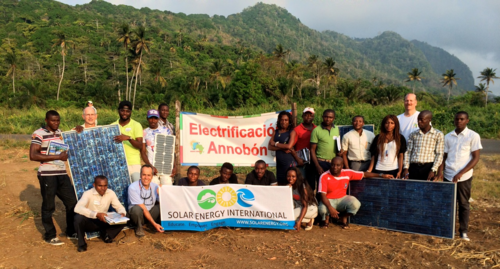 Solar Energy International(SEI) carried out two PV Solar training programs on Annobon Island. The first one during June and the second one in October 2014. These trainings, performed in spanish, were hired and funded by MAECI SOLAR, a division of Management and Economic Consulting Inc. The company is currently building a 5MW battery based PV plant to supply the island and it’s inhabitants with much needed electrical power for local hospitals, schools, airport, public services, infrastructure and many additional areas that will improve local residents’ quality of life and income opportunities. Per MAECI SOLAR’s request, both trainings included in person theory and hands on training on both grid tied and stand alone battery based PV solar systems. The program used for the practical portion of the trainings solar equipment available on the island in addition to components and specialized instruments brought from the United States by SEI. Upon the invitation of the Government of Sao Tome & Principe, and the support of the U.S. Embassy, MAECI, General Electric and Eaton Corporation traveled to Sao Tome for the purpose of an economic mission. After traveling to various locations on the island, and visiting many private sector businesses, MAECI met with the Minister of Energy, H.E. Carlos Vila Nova, and Prime Minister H.E. Patrice Trovoada to discuss the need for energy in the country. The meetings concluded with a memorandum of understanding secured between the Government of Sao Tome & Principe and MAECI. This was signed in February by HE. Carlos Vila Nova Minister of Energy. The MOU specifies a next step for the production of a feasibility study to be performed by the U.S. team of MAECI, GE & Eaton, for the installation of a solar energy solution. This study is to begin this coming summer 2016. Eaton would provide switchgear assemblies, circuit protection devices and power transformers with embedded communications capabilities to easily integrate with microgrid energy storage components. According to officials at Eaton, the microgrid has enhanced battery storage and is designed to supply reliable and predictable power to meet the off-grid community’s energy demand. It will be the largest self-sufficient solar microgrid project in Africa, they added. The US-based power management company was contracted by MAECI Solar to optimise electrical power distribution equipment for the 5MW project. MAECI is collaborating with Wise Power Systems to provide solar design, engineering and custom-made double glass modules with full microgrid system integration. Annobon Province relies on generators for the provision of electricity. Residents spend an average of 15 to 20 per cent of their income on supplemental power, said Eaton officials. The solar microgrid in development is engineered to eliminate this expense by providing clean, reliable and sustainable solar electricity 24 hours a day, seven days a week. Frank Campbell, president of the electrical sector at Eaton, EMEA added that connecting a remote community to a conventional power grid is expensive, whereas a modern microgrid would serve as a model for bringing reliable and cost-effective electrical power. The 5MW project is part of the West African nation’s National Economic Development Plan Horizon 2020, which aims to strengthen the economy of Equatorial Guinea. PITTSBURGH, PA — Power management company Eaton today announced it is providing electrical engineering services and power distribution equipment for the construction of a 5-megawatt (MW) solar microgrid system in Annobon Province, an island off Equatorial Guinea in West Central Africa. The microgrid has battery storage and is designed to supply reliable and predictable power to meet the off-grid community’s energy demand. It will be the largest self-sufficient solar microgrid project in Africa. The project is a part of Equatorial Guinea’s National Economic Development Plan Horizon 2020, which aims to strengthen Equatorial Guinea’s economy and accelerate its development through the implementation of world-class electrical infrastructure. Eaton was contracted to optimize the electrical power distribution equipment for the project by MAECI Solar, a division of Management and Economics Consulting. MAECI is collaborating with Wise Power Systems International to provide solar design, engineering and custom manufacturing of double glass modules and racking with full microgrid system integration for the Annobon Electrification Project. The Annobon Province currently relies on generators for periods of reliable electricity up to five hours per day. Residents spend an average of 15 to 20 percent of their income on supplemental power. The solar microgrid in development is engineered to eliminate this expense by providing clean, reliable and sustainable solar electricity24 hours a day, seven days a week. Eaton is providing switchgear assemblies, circuit protection devices and power transformers to support reliable power distribution across the island. 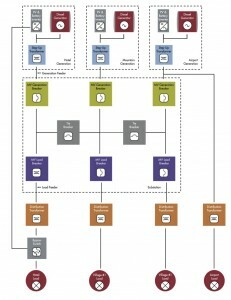 The Eaton equipment includes embedded communications capabilities to easily integrate with microgrid energy storage components and intelligently manage demand to support an adaptable, secure and responsive infrastructure. To further enhance system reliability, safety and security, Eaton’s engineering experts are contracted to provide support ranging from installation to commissioning and system testing of Eaton’s equipment. MAECI is an international consulting and project implementation firm that has formed very successful project partnerships, both as lead firm and as sub-consultant, with government ministries and departments, universities and colleges, non-governmental organizations and private sector companies more specifically in developing and emerging countries with strong emphasis in Western Central Africa and completed projects totaling in excess of $1 billion. To learn more, visit www.maeci.org. Wise Power Systems International is a full service supplier of wind and solar power installations located in Wilmington, Delaware, serving customers in the USA and internationally. The objective of Wise Power Systems is to promote the economic and environmental benefits of wind and solar power through the construction of quality systems customized to meet energy needs and budgets. To learn more, visit www.solarandwind.net. Eaton’s electrical business is a global leader with expertise in power distribution and circuit protection;backup power protection; control and automation; lighting and security; structural solutions and wiring devices; solutions for harsh and hazardous environments; and engineering services. Eaton is positioned through its global solutions to answer today’s most critical electrical power management challenges. Eaton is a power management company with 2013 sales of $22.0 billion. Eaton provides energy-efficient solutions that help our customers effectively manage electrical, hydraulic and mechanical power more efficiently, safely and sustainably. Eaton has approximately 103,000 employees and sells products to customers in more than 175 countries. For more information, visit www.eaton.com. A Smart Microgrid project hosted by the US Navy and sponsored by the California Energy Commission (CEC) will use vanadium-flow battery technology developed by Imergy Power Systems, a major energy storage systems developer. The project, a microgrid/energy storage demonstration combined with a solar PV installation, will take place at US Navy’s Mobile Utilities Support Equipment (MUSE) Facility in Port Hueneme, California. The project is part of a wider attempt by the Navy and civilian authorities to develop applications and use-case scenarios to optimize power consumption at military bases, college campuses, industrial parks and other situations. The US Navy and military have emerged as world leaders in development of microgrids and other advanced energy technologies. Microgrids at military bases could help the military lower energy costs, expand their use of renewable energy, and reduce their dependence on diesel and grid connectivity for mission critical assignments. According to Imergy, three ESP30 series vanadium-based flow batteries will be incorporated into the project, which will also feature a 50 kW PV solar panel system and GELI’s Energy Operating System (EOS) to automate the multiple applications. The ESP30 series has a capacity of up to 50 kilowatts (kW) and can store up to 200 kilowatt hours (kWh) of electricity. Microgrids are not necessarily only suyitable for small-scale projects. Earlier this year, GE announced a contract win to provide the government of Equatorial Guinea with a 5MW solar microgrid. The project, which will be built jointly with MAECI Solar and Princeton Power Systems, represents the largest self-sufficient solar power system in Africa. This initiative comes under the aegis of Equatorial Guinea’s “National Economic Development Plan Horizon 2020,” which aims to put the country on the “emerging market map” by 2020. Microgrid projects have been developed across rural areas South America, Africa, Australia and beyond. Because of a sutained effort to develop its small-scale power grid infrastructure, Alaska has emerged as a global leader in microgrid development, particularly in wind-diesel generation. The market for energy storage is growing rapidly. The California Public Utilities Commission (CPUC) has mandated that the state’s three largest investor-owned utilities add a minimum of 1.3 gigwatts (GW) of energy storage of energy storage infrastructure by the end of the decade. Worldwide revenue from deployments of microgrids is expected to grow to $25.28 billion by 2022, at a CAGR of 17.36% during 2014 to 2022.